It's Super Bowl Sunday (or Superb Owl Sunday, for those non-sports fans) and I've got the traditional football-watching dinner cooking in the crockpot. We were introduced to anafre at our favorite local Mexican restaurant when the Spousal Unit ordered it out of curiosity. It was delicious, and we spent the rest of the meal trying to figure out what was in it so I could make it at home. Anafre is Honduran bean dip. Traditionally it's cooked in stoneware pots, but I've found the crockpot works well, too. My version, like La Tolteca's, contains pork, but the great thing about this recipe is that it would be easy to make a vegetarian or vegan version. Just added the avocados this morning. Yum! I have a giant crockpot, obviously, so this will last us most of the week. I'll give you a version about 2/3 this size, and if you have a tiny pot, you'll want to cut it down further. If you're going vegetarian, leave out the pork and increase the beans and avocados. And if anyone's got good vegan cheese recommendations, feel free to add them in the comments. Throw the first five ingredients in the crockpot and cook on low heat. 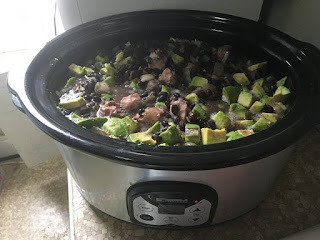 (My crockpot is super-slow, so I've had it on medium heat overnight. For a smaller pot, an eight-hour cook time should suffice.) Add the avocados when you've got 2-3 hours to go. When you're down to the last half hour, throw in the cheese. Serve with scoop tortilla chips.